I remember being so curious about your condition in high school, but too sheepish to ask you. You inspired many investigative diagnostic queries into my mother’s medical texts, and as a result, I learned a whole hell of a lot about many disorders, none of them being the correct one! I wanted to know what you were going through, what it was like to be you. Was it painful? Your ravaged skin seemed like it would be painful even to a tender touch. This is an email I recently received from a woman I graduated with from high school. I had no idea she even knew who I was, as we never spoke to one another. Twenty three years later, her words perfectly illustrate my rationale for the advice I’m about to give. I realize the title of this post is perplexing. Aren’t all children atypical in some way? I challenge anyone to find a “normal” child out there, devoid of any quirks or idiosyncrasies. For the purposes of this post, I use the term ‘atypical’ to mean children who have visible or invisible issues that cause them to be notably different from their peers. 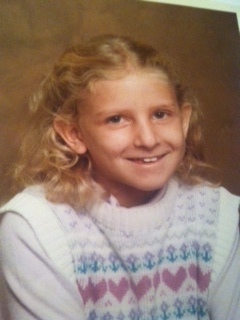 In 1985, I was diagnosed with scleroderma at age 10. My mother shared minimal information about my disease with me and told me not to tell anyone about it. I love my mom and am eternally grateful to her for raising me. I do feel that she made a mistake in her approach to dealing with my disease. She had her reasons for her decisions, which she now readily admits were flawed. Like many parents, I think she wanted to deny there was anything wrong with her daughter. If she denied my disease with fierce devotion, maybe it would go away. My mom’s plan not to discuss my disease was half-baked at best. It’s difficult to ignore such a potent physical metamorphosis. My disfigurement aside, there were so many things I couldn’t do that set me apart from my peers. You can read more about that in my recent post: Tales of a Gym Class Freak. The bottom line is that ignoring something does not make it less real. I was not equipped with the tools to accurately communicate information about my disease. It took me until 40 to develop a solid and confident response (that would be this blog) to the whispers that have followed me around for the past three decades. My advice to parents is to be open about whatever your child’s issues happen to be. Children take cues from their parents. If their parents are hesitant to openly discuss important topics, they will grow fearful of them and the ‘secret’ will fester. Don’t underestimate the toxicity of secrets. In future posts, I will share how difficult it was for me to disclose even the tiniest morsels of information about scleroderma to curious questioners. Even my best childhood friends knew very little about my disease. Simple questions would trigger fearful tears from me, so they learned quickly not to ask. Before I became a reading specialist, I was a fourth grade teacher. Each year, I had several students who fell into the ‘atypical’ category. Some parents forbade the school to talk about their child’s differences with the class. They claimed that they wanted their child to have as normal of an experience as possible. These parents loved their children with fierce intensity and did not want them to suffer from labeling or negative stereotyping. Of course, I respected their wishes and did not violate their request. Other parents were open to coming in and sharing information about their child with my class. I would invite these parents in and seat them on my swirly black leather chair. My students sat on the floor in a circle surrounding the parent speaker and were given the opportunity to ask questions and learn. Sometimes the ‘atypical’ child wanted to be present for the conversation and even lead the discussion. Other times, the child chose not to remain in the room while the dialogue occurred. Over the years I had parents talk about autism, cerebral palsy, tourette syndrome, ADHD, peanut allergies, hearing impairments, and more. If language barriers or other factors kept parents from conducting these discussions, the school social worker or I would step in. Each time, I saw a transformation in how my class treated their ‘atypical’ peer. Without exception, these discussions led to deeper understanding and empathy. I only wish I had been brave enough to start off these discussions by first telling my students about my scleroderma and explaining why I looked different. This remains one of my hugest regrets, as I think it would have brought comfort to so many of my former students. Parenting an ‘atypical’ child presents extraordinary challenges. Every circumstance is different and must be carefully considered by those who know and love a child best. Some parents may argue that they don’t want to call further attention to their ‘atypical’ child or cause them to feel insecure. I’m willing to bet that 99.9 percent of the time, that child already feels quite different. If I could turn back the clock, I would have wanted my mom to come into my childhood classrooms each year and talk to my peers about scleroderma. I think it would have demystified the rumors that surrounded me and allowed me to be comfortable in my thick skin decades earlier. This is my weird way of beating any critics to the punch. My mom is a wonderful lady who has overcome tremendous obstacles in her own life. Before you judge her, consider how you would feel if your child one day writes a blog about a poor parenting choice you made. We’ve all made mistakes and my purpose in sharing this is not to publicly shame my mother. Instead, I hope to convey the importance of open and honest communication about tough topics and maybe even change some parents’ approach to disclosing information about their ‘atypical’ child. My siblings and I are very protective of our mom. We believe no one has the right to judge her, except the four of us. I am not a child psychologist, nor do I play one on T.V. My advice to parents is strictly based on my own childhood experiences and what I’ve observed in my 19 years of teaching children. This post was not that funny. Sorry about that. The next one will be funnier. Enjoy your blog so much Lisa. As a special ed teacher for many years, I dealt with all sorts of children. Some of them them had obvious problems like vision problems, Others were very definite behavior problems and would disrupt the class in as many ways as they could to get attention. But the two children I remember the most were my boys with autism. One never spoke to me, but he would go back to his home room and tell his other teacher everything that I said. He even did a science fair project that he explained to parents during the fair. Amazing. The other boy had aspergers, and was excited to explain what his problem was and why he behaved the way he did at times. Those boys and the many other children I have worked with taught me more then I could have ever taught them. Take away the mystery and friendships occur. It is a joy to watch. This may be your most important post yet. Thank you for sharing. Bravo, Lisa! My favorite post yet. Keep ’em coming. You are an extraordinary writer! Knowledge is power. Thank you for sharing yours and empowering us to do the same. I wish I had offered this opportunity to countless students whom I have taught over the years.